Is It Possible To Convert A Gas Car To Electric Under $300? Home/Do It Yourself DIY/Is It Possible To Convert A Gas Car To Electric Under $300? I have been reading a couple electric car conversion guides that I bought lately. 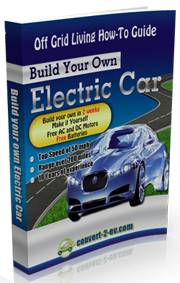 The authors claimed that they have converted their gas car to run on electricity for under $300. Can you really do the conversion for that kind of budget? Honestly, I think it is going to be a very tough project if you limit yourself for only $300. I don’t think it is impossible, but you would need a lot of preliminary preparation. The bulk of the cost for a DIY electric car conversion is in the batteries and the DC electric motor. No doubt the guides will teach you how to get used or reconditioned batteries from electric golf carts and from industrial areas. The challenge is the time you have to invest to source for all the batteries. A used electric motor will also cost at least $150. The best option for you to find cheap electric motor is from EBay. That will depend largely on your luck. Sometimes when you go to the listing site, you may not see any electric motor up for auction. You may have to wait weeks or months to find the right electric motor. Lets face the fact, converting a gasoline driven car to electric under $300 is not impossible, but you have to do a lot of leg work. That investment has not include all the tools needed for your retrofitting project. You may have to buy or rent new tools for the project. If you really want to have a success electric vehicle conversion, you would need to invest at least $3000. With the cost of gas prices, DIY Electric Car conversions have become more popular than ever before. Most people consider this a daunting task but the truth of the matter is that this DIY project can be easier than you think and also a whole lot of fun. You don’t have to put gas in your car! – Finally! We are seeing a future where the electric car will actually be on sale to us consumers. Consumer models are less than a year away and are going to be highly welcomed by many. But we also know they will be ridiculously expensive, and some believe too late. The initial batch will cater for high income people who feel good about helping the environment, but don’t even think about being frugal. get. There are several — you don’t have to worry about spending tons of money on gas, for a start. Gas prices recently fell below $4/gallon (they were rising for a long time before that) but there is no telling whether or not they are going to go up again. Hi Great article and thanks for featuring my blog post. No problem Forest. You did a very informative blog post.